With not all that much to talk about ahead of CPI, I’ve been spending some time playing with other data-sets — today I was looking at the monthly trade data (in particular table 14a, MERCHANDISE EXPORTS, Country and Country Groups, FOB Value). 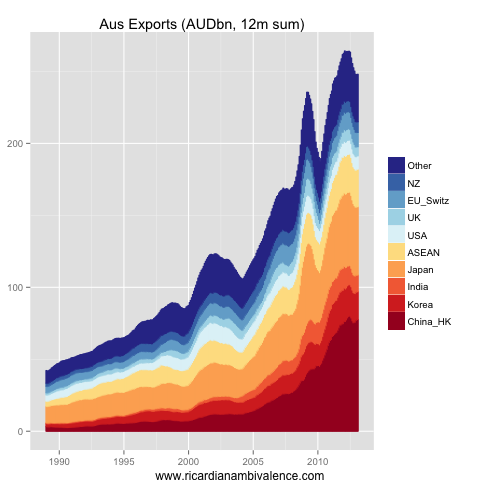 Summing the data over a rolling 12m window (to smooth out the seasonality) you can immediately get a very nice history of Australian exports. In particular, you can very easily see the massive growth of exports to the Asian region — and in particular to China (note: I’ve summed China with HK & EU with Switzerland). These are by value, so a part of the plateau in exports to the Asian region reflects the recent decline in bulks prices. This entry was posted in AUD, economics and tagged trade. Bookmark the permalink.